This entry was posted in Hiking Gear Materials Hiking Tips and tagged cotton merino wool nylon polyester sun protective clothing upf uv radiation uv rays on September 26, 2018 by Laura P.
Hiking is the quintessential outdoor activity and even if the sun does not shine brightly from a clear blue sky, the majority of its harmful UV-radiation will still reach through the cloud cover. Besides weather conditions and cloud cover, UV-radiation levels are influenced by sun height (depends on time of day and season), latitude, ground reflection (especially from snow and water but also sand), ozone level (varies throughout the year and even day) and altitude (UV levels rise with 10-12 % for every 1000 meters increase in altitude). Rain or shine, most of us only worry about sun screen for the skin areas which are completely exposed to the sun most of the time, such as the face and hands, and perhaps uncovered arms and legs when hiking in warm weather. But what about the skin underneath your clothes? Did you know that you can easily get a sunburn and other sun-induced skin damages underneath a basic cotton t-shirt? 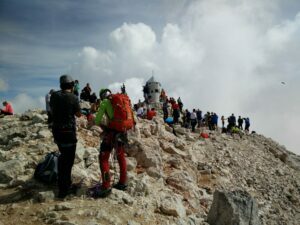 For hikers, mountaineers and other outdoor people it is thus a good idea to ensure that the skin is adequately protected at all times, but especially when hiking in warmer weather and wearing only one light layer. In the following we will provide you with an overview on how to protect the skin underneath your clothes whether by choosing hiking clothing made of materials which naturally offer sun protection or materials which have been treated to provide sun protection. The basic principle behind all sun protective clothing, however, is its ability to absorb UV radiation and turn it into harmless heat instead. It is true that all clothing disrupts UV-radiation to some extent, but the level of protection varies greatly – from a basic white cotton t-shirt which can let more than 20% of the UV-radiation penetrate through, to top-rated sun protective clothing which will let less than 2% of the UV-radiation through. Sun protective clothing is rated in terms of UPF – the UV Protection Factor which indicates how many percentages of UV-rays penetrate through the respective fabric. A UPF-rating of 50 means that 1/50 UV rays (≈2 %) penetrates through a given fabric or, said differently, that it protects against 98 % of UV-radiation. If you are wearing two or more layers for hiking, the skin underneath them should be adequately protected almost no matter the UPF-rating of the individual garments, but on warmer days when you are just wearing a base layer you should make sure that it offers adequate sun protection. 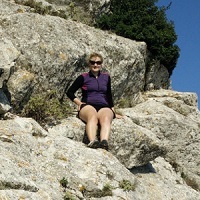 In terms of hiking pants it is always an advantage that they provide UV protection as emphasized in our review of the best hiking pants for women. For sun protective clothing to receive the Skin Cancer Foundation’s Seal of Recommendation, it needs to be rated as providing at least UPF30. Sun protective clothing made of natural fibers. Sun protective clothing made of synthetic fibers. 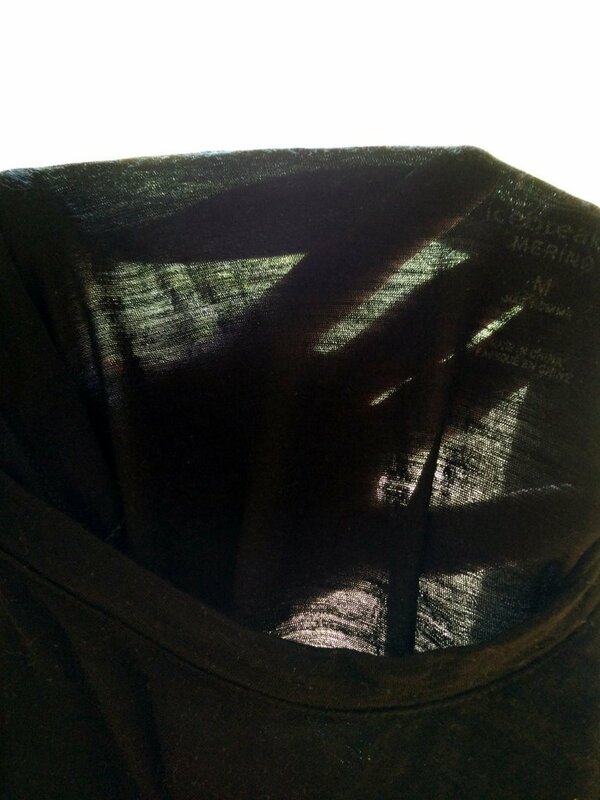 Sun protective treatments applied to garments by the manufacturer. Laundry detergents which you can use at home to boost the UPF-rating of most garments (except synthetic materials). As mentioned above, cotton is – like most cellulosic fibers (e.g. flax, hemp, rayon etc.) not very sun protective on its own and furthermore has multiple other downsides when it comes to hiking clothing (read more in the article Why is cotton bad for hiking). Fortunately, there are other natural fabrics which offer better sun protection – namely Merino wool which is recommended for all year round use. The Merino wool fiber absorbs radiation throughout the entire UV spectrum and you can usually count on a UPF of at least 25 for a Merino base layer, but some offer protection up to UPF50. Again it depends on the weave, density and the other factors mentioned above. Read more about Why you should wear Merino wool clothing here. As a fiber, silk performs similarly to wool in terms of sun protection, but as it is often weaved into very thin and lightweight fabrics, silk garments will seldom offer adequate UV protection. 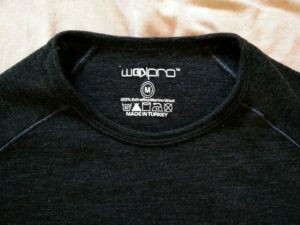 It does, however, have other qualities which you can check out in our Comparison of Base Layer Materials. In the 1990s the so-called second generation of synthetics was developed with a focus on UV protection. Polyester and nylon fibers are on their own good at disrupting UV radiation, but the UPF offered by the individual garment can differ greatly depending on the other factors mentioned above. Polyester is often incorporated in tight-fitting stretchy apparel and here it is particular important to note that whenever a garment (regardless of material) is stretched more than 10% beyond its natural form it can lose up to 40% of its UV protection as more light can penetrate through the increased spaces between the fibers. Some manufacturers will apply treatments to garments, whether made of natural or synthetic fibers, to provide or strengthen their capacity for sun protection. Interestingly, many of these sun protective treatments are identical or related to the sun filters used in sun creams and lotions. Australian Coolibar for example bases their treatments on the physical sun filters zinc oxide and titanium dioxide. Other examples of UV protecting agents include Tinofast, Rayosan, Cibafast N3 and Cibafast W FL. Each type of treatment is generally only suitable for one type of textile as it has to complement the chemical structure of the textile fibers. Needless to say, all UV absorbing treatments should be non-toxic and not irritate the skin. If you have one or more garments which you love to hike in, but at the same time know that they aren’t exactly sun protective, you might be interested in making them UV protective on your own! It sounds too good to be true, but you can actually achieve this by washing your clothes with SunGuard Protection which comes as a powder that you add to the cycle of clothes you wish to “sun proof”. Each sachet is enough for a load of clothes and will neither color nor change the “feel” of the garments. 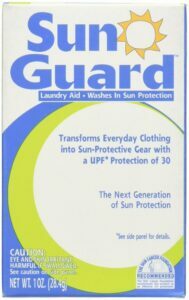 After washing and drying the clothes, they should provide a UPF around 30 – the sun protective effect should last up to 20 washes. Note, however, that garments made of synthetic fibers such as polyester, acetate, acrylic and nylon cannot be treated effectively with SunGuard.